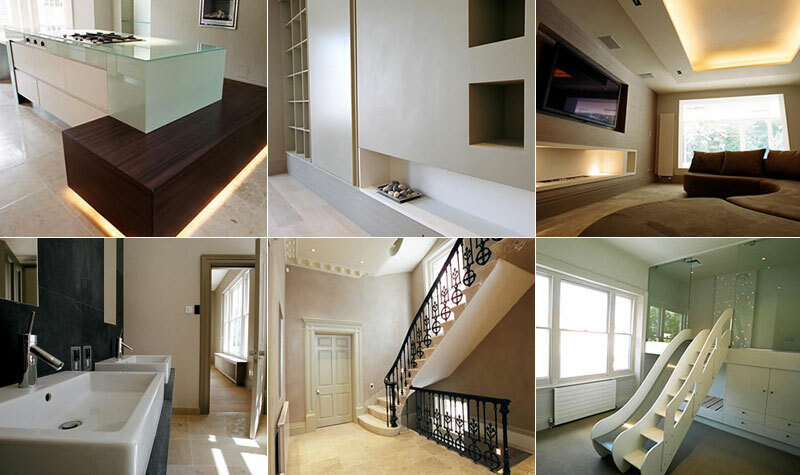 In 2004 we accepted the rare invitation to carry out a complete refurbishment of a five-storey property in Chelsea. Throughout 2004/05 we successfully transformed this prestigious address into a luxurious but comfortable home that combined both traditional and contemporary styles. After extensive excavations had been undertaken, and new staff accommodation, gymnasium and plant rooms created below the existing lower ground level, the rear of the property was then extended. This substantial space incorporated a glazed living area with terraced roof, and a stone spiral staircase was added, which led to the highly-styled reception room at upper ground level. What followed was a “back to brick” remodelling and modernisation of the property, covering four further floors, all finished to the highest specifications. We installed state-of-the-art lighting and audio visual systems and applied extensive veneer work throughout. The polished plaster and contemporary furnishings gave the property a modern and luxurious, yet warm and traditional feel. This vast project represents the full extent of services offered by lbconstruct and reflects the pride we take in successfully manifesting our clients' visions and ideals. Leading on the project was Luxury Interior Designer Callender Howorth.